Pro Tools | Shootout Results - The Best Upmix Plug-ins - Which Is Your Favourite? Immersive Sound is big news at the moment. With expanded surround workflows being integrated into Pro Tools 2018 Ultimate and major broadcasters only accepting and distributing 5.1 mixes, plus the push by some distributors into Dolby Atmos, the role and use of "upmixer" plug-ins has become increasingly relevant. Last year we launched our blind upmixer shootout poll, which compared three market leading upmixer plug-ins, without anyone knowing which ones were being compared. We had a great response and it gives us pleasure to be able to finally reveal the results. The Waves UM226 is already at a disadvantage in this contest, as it is the oldest and only works in 5.1. There is of course its big brother - DTS Neural, but it is a lot more expensive. In my own limited blind test among my peers, against all odds, the UM226 won, absolutely contradicting our poll. Indeed in the early days of voting it was in the lead. Like Penteo, there's a definite characteristic to the sound the UM226 produces, which we'll look at in the analysis, which seems to have gained it a bit of a bad reputation in the industry. To do this, I've used iZotope Insight to see if I could measure what my ears were telling me. With multi-instrument pieces such as this, Penteo really shines - almost to the extent of fooling you that this piece was originally mixed in 5.1. The placing of the instruments is enveloping and feels fresh and original. In contrast, Halo and the UM226 stick with the more traditional approach, placing reverb and/or wide components to the rear. You can see the enveloping nature of Penteo in the Insight display, in that it has a more circular shape, instead of the heart style shape that Halo and UM226 deliver. With this piece, although there is a solo instrument, it is not panned dead centre. When mixing upmixed elements in with other elements, such as a feature film mix, it is really handy for the sake of clarity, to have a more definite front centre image to balance against dialogue. Looking at the Insight displays, you can see that Halo and UM226 maintain the image at the front, whereas with Penteo it is more in the middle of the room. This is where it becomes important to assess upmixer performance in context. 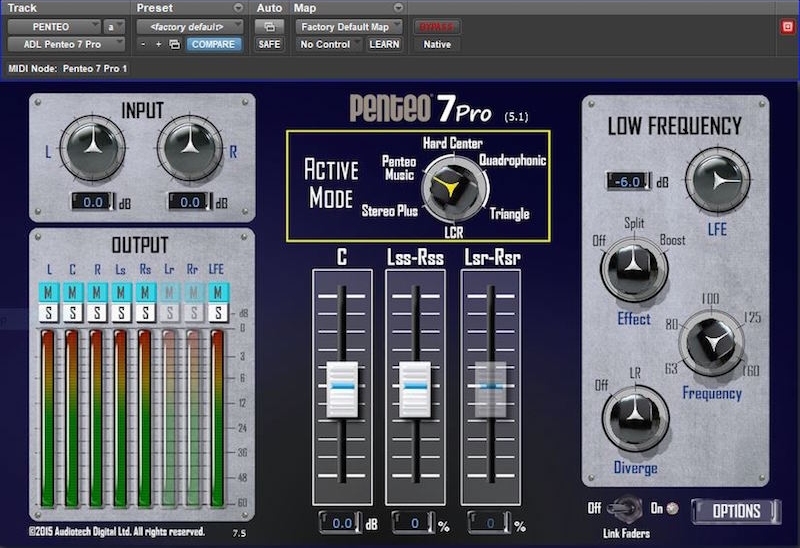 Just using Penteo to upmix the track on its own, as a stand-alone listening experience, may garner better results than if the upmix was balanced against other elements. It is of course also very subjective, both between different listeners and depending on the other material presented with it. In this example, all three plug-ins maintain a good centre image with the lead vocal, nicely spreading the vocal reverbs around the soundstage. However for my tastes, with Penteo, the way it places certain instruments around the surrounds can become a little bit distracting and you start wondering why certain instruments are placed where they are. Again, this is very much a personal taste thing. With this piece, Penteo would be the upmixer I would personally use if we were using this piece in a music-driven film montage sequence. Especially when the synths and layered vocals come in, it delivers a warm enveloping feel - ideal for this type of sequence. Halo and UM226 deliver a similar placement, maintaining a solid centre image but one big difference is the comparison in the nature of the sound. The UM226 seems to add a sparkly brightness to the upmix. It very much depends on the listener - some perceive it as brightness, some perceive it as artifacts. From experience in general Halo is better than the UM226 at disguising artifacts that can creep in from lossy encoded material. Having said that though I've never had any issues with fold-down compatibility with UM226, which I gather a lot of other people have. In this respect, Penteo was also very transparent. This piece is an entirely different matter from the other four. Here the audio was originally mixed in 5.1, then folded down in Dolby Pro Logic 2 to an LtRt. This LtRt mix was then fed through our upmixers, all set to their "film" preset. It's here where we start to see differences in the accuracy of the three plug-ins. At the beginning of the piece in the original 5.1, the sobbing is panned hard front left. Both Penteo and Halo upmix this as between rear left and front left. It's a subtle but important difference. Only the UM226 actually gets this right. I was careful to set the plug-ins to their film presets, as I was mindful of the importance of maintaining the correct imaging. Otherwise, all three did a good job of spreading out the wide surround reverbs and background layers around the soundscape. While preparing this analysis I also experimented with converting the output of these upmixers into Ambisonics, using the Facebook 360 tools now included with Pro Tools Ultimate. Unfortunately with all the examples, especially this last one, I got incredibly varying results in terms of compatibility. This is where for my line of work, for future proofing, Halo wins hands down, with its 7.1.2 and Ambisonic capability. The facts remain, that in this blind test, using these examples, listened to solely in the context of this test, the vast majority preferred the results that Penteo delivered. However, once you're in the context of a mix, you may find that you change your mind. What do you think? Do you agree with my analysis or even the result? Please let us know in the comments section.